The machete knife is the most prized possession of the poorest South American peasant to African tribesman, and for good reason! A machete will give years of good chopping, cutting, hacking, slashing, splitting, scooping, scraping, digging, hammering, carving, crushing, cracking, whittling, and smashing of just about anything you can think of that needs this sort of work done. A good machete is the ultimate outdoor companion. 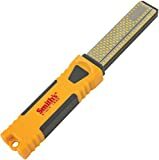 Its uses range from clearing land and chopping down trees to killing both fish and game, it is the perfect tool for gutting, filleting, scaling, quartering and butchering too. As a large combat knife, it’s extremely useful for self-protection and preservation. No other knife can serve as many purposes as a machete can. With so many varieties of machetes for sale, it can be confusing to know which machete-style is best for what job. Knowing how to choose the top machete for your intended use will make machete control, and you work much more effective. This machete has two cutting edges. Many people will cut one edge to a razor sharp finish for finer cutting and slicing options, and keep the other one duller for chopping. Or, sharpen both sides with stones and just flip the machete over when for being able to do more work without having to stop and sharpen. Double edge machetes can cut from any angle with just a flip of your wrist, which also makes an excellent tactical machete as well as outdoor survival machete or even just for yard work. Unlike traditional machetes, double edge survival machete blades are ready to meet today’s practical requirements. The Bolo machete is the favorite in Asia and the Pacific Rim. This machete has a widened point that shifts its weight forward. It chops and slashes with ease and is an excellent survival machete or outdoor sports machete. The Bolo machete can be used for training, hiking, camping, survival, hunting knife. Heavy machetes are made widening out towards the tip for maximum cutting and chopping power. If you have heavier trees and wood to chop and other rugged outdoor activities this is the choice for you. The Kukri machete is like the Cadillac of all machetes. 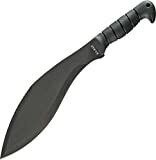 They are typically more expensive than other machetes, but nothing can out-cut or out-chop a good Kukri style machete. They feature a distinctive balance with the weight-forward towards the tips. The edge is at an angle to have a unique deep bite with every stroke. The Kukri is designed for when you need a hard-working machete for big jobs. The Panga machete comes in a selection of different styles and is a favorite in the African continent. They are heavy duty workhorses that will chop through thick brush and cut down small trees and saplings. This heavy machete will also make a fantastic general farm tool as well. 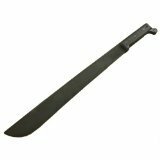 A Sawback machete is an excellent choice for an outdoor survival machete or a farming machete as it has a saw back to be able to saw through the thicker terrain. Government Issue machetes and black machetes typically feature the saw back for army machetes and other government-issued machetes. For jobs that need two hands, the two-handed machete is the best choice. Being able to use two hands give you better leverage for cutting down trees, tangled vines, and thick terrain. This machete makes a great jungle machete. When it comes to knowing how to choose the best tool, consider a high-performance blade that lasts. 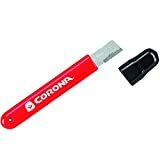 Those machete blades are made of 1095, AUS-8, 8Cr13MoV fully temper carbon spring steel as well as 9Cr18MoV and 420 Stainless Steel – capable to resist chipping, cracking or breaking, so they last practically forever. The blade thickness and Rockwell hardness should be 1/8″ and HRC 55-60. A full tang machete is going to be stronger and outlast any other machete. This is one solid piece of metal that has a handle attached around it. You may also want to make sure you have a sheath for your machete to help carry and protect your machete from the environment. It would be better if the sheath comes standard with a durable Kydex and adjustable nylon strap. The strap will allow wearing the sheath around the waist or back. A machete with sheath makes a great gift for any outdoorsmen whether they are using it for extreme sports, hunting, camping, or fishing. Don’t forget the landowners or military friends. A good tactical machete could quite possibly save a life. 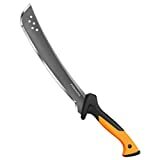 Some of Amazon.com’s most popular brand name machetes for sale are Cold Steel machetes, the Cold Steel Kukri machete, and the Tramontina machete. Cold steel machetes come in a large variety of options and are from 1055 Carbon Steel with a tough spring temper. They are then surfaced with a black, baked-on anti-rust finish. Every Cold Steel machete knife comes with an excellent utility edge which, with just a little work, can be done hair shaving sharp. The tough, Polypropylene handles of Cold Steel machetes are designed to provide a comfortable secure grip, and they are rugged enough. The Tramontina machete is extremely affordable and is a great general purpose machete. It is from durable carbon steel and comes with your choice of a wood handle or a black rubber handle. Some popular brands who sell the best brand machetes around are below. All these machete brands offer a durable multipurpose survival tool that can cut, chop, slash, and saw its way through any wilderness situation. Don’t be in trouble when you are outdoor with a cheap machete that fails on you when you need it most. Invest in high-quality machete today and you won’t need any other. Try $50+ machetes, those blades retain a sharp cutting edge and won’t bend or break under extreme abuses. So the question of how to choose between machetes isn’t that difficult after all, right?